One year ago today, I was headed to Burning Man. Which, honestly, was something I thought would never, ever happen. I'm not a big camper in the first place. And after spending a day at Tassajara last year (where it was hot and humid and I was miserable - thank god for the delicious food), I had decided I'd never be able to do the Burning Man thing. Camping? In the desert? Without running water? I didn't think I was capable of dealing with that. Then I had the opportunity to go. With a friend who promised to take care of me. I thought about it and decided I should go, just to see if I COULD do it. Now it was a challenge. Getting to the entrance gate and telling them it was my first time. I had to get out of the car, make a playa angel, and then ring a giant bell while screaming, "I am no longer a virgin!" Which was embarrassing and kind of fun but I'm glad there's no photographic evidence. Using a port-a-potty for 3 days. Though they are some of the cleanest you'll ever use. Also, I don't know what people did at this event before Purell was invented. We didn't leave camp without it. Dust. It's everywhere. There was a dust storm one night, and I accidentally left one corner of my tent entrance unzipped. There was dust all over pretty much everything in my tent. Thankfully, it was our last night there, so I didn't care too much. Playa dust has a way of sticking around though, and a year later, there's still some in our tent. I don't think it'll ever be completely dust free. The last bit is all my own thing, but there were times when I simply just did not feel like I was "weird" enough to be there. I suppose compared to people I work with, I may be a little...odd, but at Burning Man, I an undeniably normal. I had no costume, no oddly colored hair, and I was pretty much fully clothed the whole time. Which isn't to say that I have a problem with anyone else doing these sorts of things, but when you're with about 30,000 other people who are dressed (or not dressed at all) like this, it was hard for me to not feel like I didn't belong. Bikes EVERYWHERE. I loved being able to ride my bike to get around and not wear a helmet or worry about cars. That may have been my favorite part about the whole thing. ART! Everywhere! And I probably only saw half of it. The scale of things is just amazing. And some of it is interactive and encourages you to participate. People write messages all over the man which eventually get burned. Same idea with the temple that's built every year. And it's all in the middle of the desert. It's pretty amazing. For the most part, people are very friendly. Lots of people have theme camps with games or other things to draw you in (giant trampoline, beer, roller skating!). We shared food with one of the camps in front of us and ate meals with them a couple of times. There's a definite sense of community. There's always something to do or see. Or not. It's entirely up to you. We would usually wake up, eat, go out and see some things, come back to camp and take a nap, and then go out again when it got cooler. There was a nice sense of freedom from not having a watch or really having anything scheduled to do, yet always knowing there was something to do if we wished. Camping at the very edge of the event. We stayed with a friend who usually camps in this same spot, and I really think it was the best place to be. There was less noise, and less people (and we were close to a set of not oft used port-a-pottys). So when we came back to camp, it was easier to relax and feel like we weren't still in the middle of everything (which was a little overwhelming at times). The Man Burning! It's a giant wooden thing ON FIRE! There's usually some sort of fire dancing happening on the ground to entertain the crowd and then they start to burn that sucker and you get to watch and have whatever life changing experience you want to have (or not). It's really freaking cool. So, as you may have gathered, not a totally life changing experience for me, but I was really proud of myself for surviving the whole thing without any issues. I didn't even get sunburned! In fact, it may have been the only time I've actually tanned a little bit. It also makes you appreciate running water and indoor plumbing so much more. After 3 days I was definitely ready to come home. I also figured that I wouldn't have much desire to go back having been once and feeling like that was enough. But as I'm reading tweets and seeing photos, the nostalgia is kicking in and a little part of me is sad that I won't be there this year. Of course, the rest of me is really glad that I'll be able to wash my hands with water and soap all weekend. 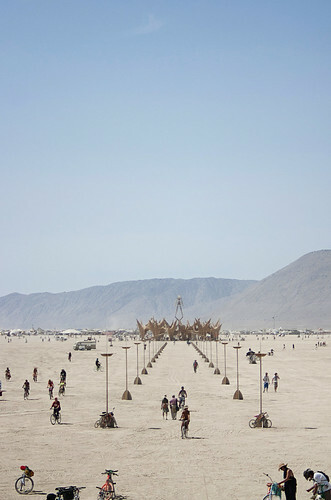 Edited to Add: If you're curious to get more detail about Burning Man (because my mediocre account doesn't do it justice), Audi has a great description over on her blog. The last bit is all my own thing, but there were times when I simply just did not feel like I was \"weird\" enough to be there. I suppose compared to people I work with, I may be a little...odd, but at Burning Man, I an undeniably normal. I had no costume, no oddly colored hair, and I was pretty much fully clothed the whole time. Which isn't to say that I have a problem with anyone else doing these sorts of things, but when you're with about 30,000 other people who are dressed (or not dressed at all) like this, it was hard for me to not feel like I didn't belong. \n\nSo, as you may have gathered, not a totally life changing experience for me, but I was really proud of myself for surviving the whole thing without any issues. I didn't even get sunburned! In fact, it may have been the only time I've actually tanned a little bit. It also makes you appreciate running water and indoor plumbing so much more. After 3 days I was definitely ready to come home. \n\nI also figured that I wouldn't have much desire to go back having been once and feeling like that was enough. But as I'm reading tweets and seeing photos, the nostalgia is kicking in and a little part of me is sad that I won't be there this year. Of course, the rest of me is really glad that I'll be able to wash my hands with water and soap all weekend.\n\n\nEdited to Add: If you're curious to get more detail about Burning Man (because my mediocre account doesn't do it justice), Audi has a great description over on her blog.